Here are some hacks to boost your social media marketing. Setting social media goals is hard. “How cool would it be to drive 300 sign-ups a month from Facebook Ads?” This is how I tend to go about setting social media goals. I pull an aspirational number out of the air and go for it. Would it be cool to have a regular, predictable stream of new users coming to Buffer via Facebook Ads? Absolutely! Is this the right way to set goals? Coming up with social media goals for our marketing team here at Buffer has often been a bit haphazard for me. Imagine having a system of goal setting to help create rational, achievable goals. 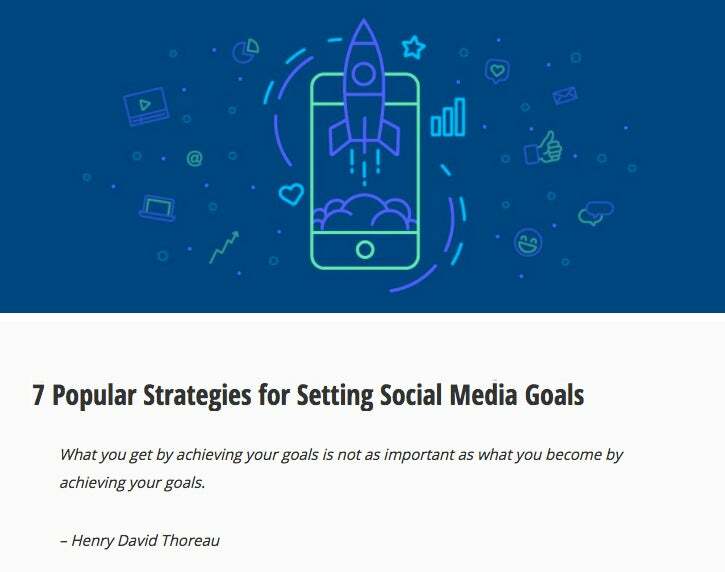 This set me out on the research path to look into other popular goal setting strategies and frameworks that exist and seeing how these might work for social media marketing. Keep reading below to see the amazing strategies that I found. I love this quote from Thoreau because it emphasizes the process over the end result. I often find myself wondering what exactly is the best way to set social media goals … or if having no goals at all might be a possibility! One interesting bit of research I came across is that a study found a 33 percent increase in the completion of goals among those who wrote their goals down, created an action plan and shared with a friend. These people achieved 76 percent of their goals by having a specific goal-setting strategy. So with this in mind, I thought it’d be interesting to dive into seven of the most popular goal-setting strategies used by marketers and see if any of the ideas here might resonate with you and your social media marketing. S for Specific -- The more specific you can be with writing down your objective, the easier it will be to clearly see what it is you need to accomplish. Often, answering the five “W” questions -- Who, What, Where, Why and Which -- can help you achieve greater specificity. M for Measurable -- Can your goal be measured? How will you know when you’ve achieved your goal? A for Attainable -- Another way of putting this is “realistic.” Is it possible to achieve the goal you’ve set for yourself? R for Relevant -- For businesses, a relevant goal means that it has the potential to impact your business objectives, vision or values. T for Time-bound -- Give your goal a deadline. SMART goals are one of the longest-lasting, most popular goal-setting frameworks for business. Peter Drucker, the founder of modern business management, often is credited for coming up with the basis for SMART, and the specific mnemonics can be traced back to mentions as early as 1981. SMART has been a successful goal-setting framework for a long time because it is easy to understand, to act on and to follow up with. Let’s take Facebook page growth for instance. If you want to set a goal to grow your Facebook page’s likes, here’s what that might look like with the SMART framework. Measurable -- Choose a specific number for the growth. Attainable -- Make sure the number is realistic. Relevant -- Does growing your Facebook page support your business’s objectives, vision or values? Time-bound -- What deadline will you set? 1. 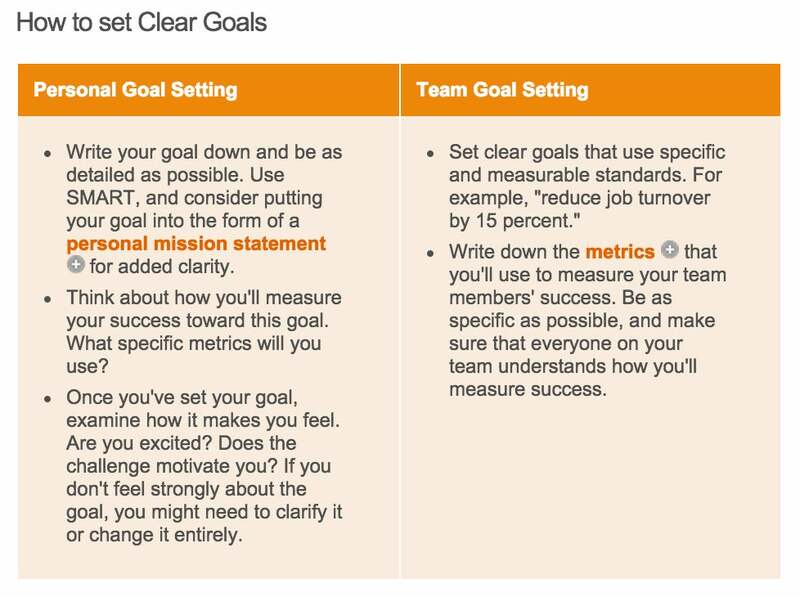 Clarity -- Similar to the specificity from SMART goal-setting, clear goals help immensely with understanding the task at hand, measuring the results and achieving success. 2. Challenge -- The goal should be difficult and challenging enough to prove motivating, but not so challenging that it’s impossible to achieve. Using the Inverted U method is a good way to test for appropriate challenge levels. 3. Commitment -- Get your teammates to buy into the goal. Involve them in the goal-setting process. 4. Feedback -- Measure your progress and seek advice throughout the pursuit toward the goal. 5. Task complexity -- Be careful in adding too much complexity to your goals as complexity can impact morale, productivity and motivation. In the late 1960s, Drs. Edwin Locke and Gary Latham performed much of the research that has informed our theories of goal-setting, showing how goals and feedback can be huge motivating factors for business employees. Through their research, Locke and Latham settled on the five principles of goal-setting mentioned above. The specific and challenging goals led to higher performance 90 percent of the time. Let’s try out our Facebook page example again. Clarity -- Set a clear goal for what we want to achieve with Facebook page growth. Challenge -- Does the task fall into the sweet spot between low pressure (not challenging enough) and anxiety-inducing (too much pressure)? Commitment -- Get buy-in from team members who may be helping with the project. Feedback -- Seek advice in creating the goal and in progress throughout. Check the stats periodically to see how you’re doing. Task complexity -- What is involved in growing a Facebook page? Limit the complexities by focusing on a set number of specific growth strategies. Objectives -- This is what you hope to accomplish. Objectives usually take the form of broad goals that are not measurable (that’s what the Key Results section is for). Key results -- Based on objectives, the key results are almost always defined with a specific number. 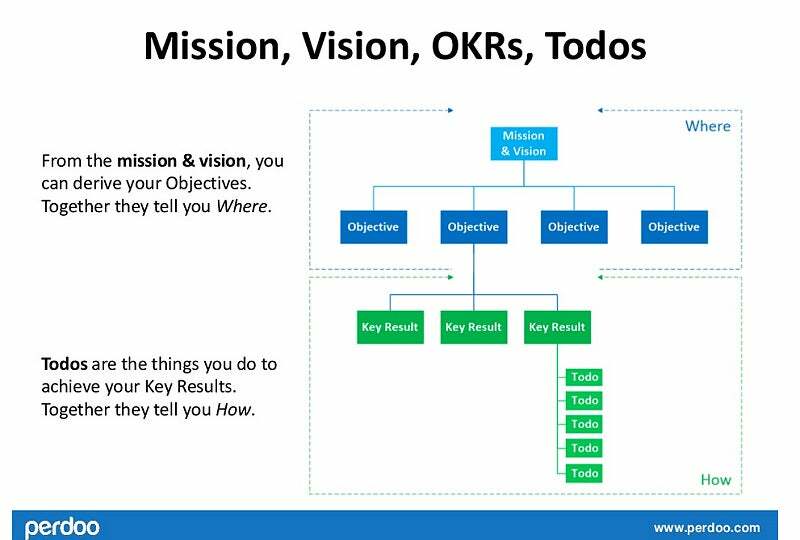 A concept invented by Intel and used with amazing success by Google, OKRs help set strategies for teams and individuals and allow a way to evaluate these strategies and reflect on performance. The simplicity of OKRs is particularly attractive: Name the objectives you want to achieve, and come up with a key number to strive for. Google is probably the most notable proponent of OKRs for goal-setting. They’ve shared a lot about their processes, including this tip about how to come up with the key results. One of the ways this works is that Google aims to reach 70 percent or more of their key results. One hundred percent would be stellar; hitting 70 percent of an overboard goal is still pretty great. Others have come along with variations of OKRs that include additional detail in the form of Actions or To-dos that help define the path to achieving the Key Results. Let’s go back to the Facebook page example. Objective -- What is it that we hope to achieve with Facebook growth? Think Big -- Define your ultimate goal. Act Small -- Identify the milestones that will help you achieve that goal. Move Quick -- Come up with a timeline for achieving each milestone. Organizational psychologist David Van Rooy came up with a simple framework for goal-setting, which he touches on in his book Trajectory. The three-part framework aims to distill the existing research and best practices for goal-setting into a simple set of rules. The result of these takeaways is Van Rooy’s BSQ system, which borrows elements from the others discussed in this list. “Think Big” has similarities to the Objectives in OKRs, for instance. Let’s see how this might work with our Facebook goal-setting. Think Big -- What would be a major accomplishment for us on Facebook? Act Small -- Which steps would we need to take in order to achieve this goal? Move Quick -- What timeframe would work to achieve each of these steps? BHAG stands for Big Hairy Audacious Goal. A bit different from the other goal-setting frameworks on this list, BHAGs (pronounced BEE-hags) tend to be big-picture social media goals with a visionary aspect. For social media goal-setting, these could be the overall social media goals you wish to achieve on a social channel or with your social strategy as a whole. Instead of focusing on what you might achieve in the coming days or months, BHAGs focus on “audacious 10-to-30-year goals” that propel you toward your brand’s vision, according to Collins and Poras. Let’s try out our Facebook example again. 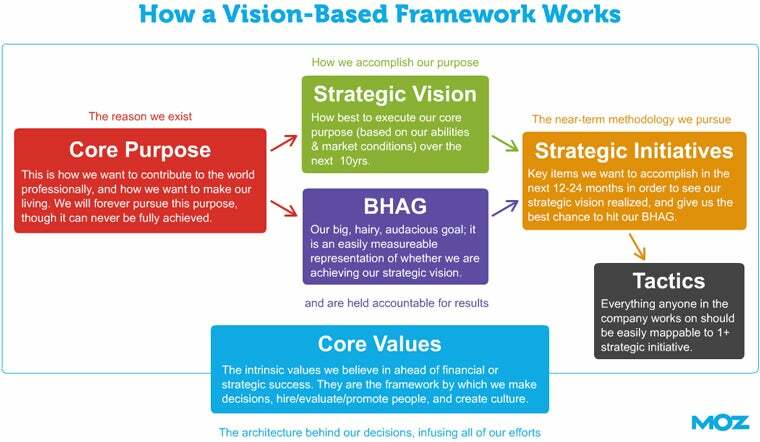 BHAG -- What type of audacious thing are we hoping to achieve with Buffer? 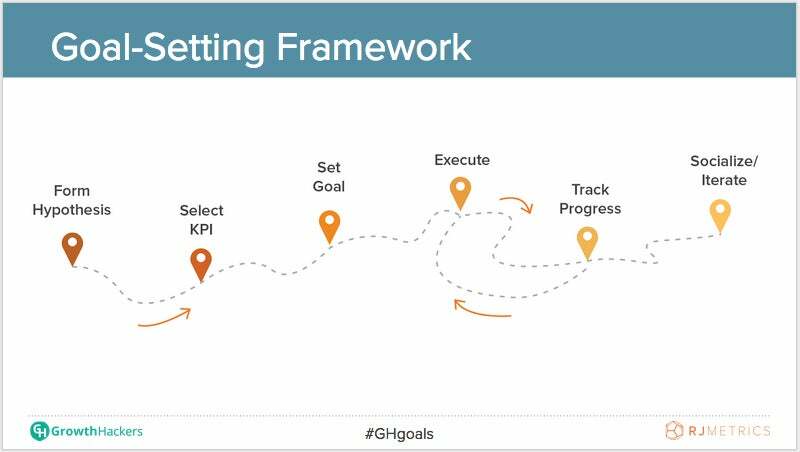 This process shared by Anna Kegler at RJ Metrics involves many of the same stages we’ve touched on before, albeit with an emphasis on the complete process of goal-setting from start to finish. One of the unique elements of growth hacker goal-setting is the involvement from the whole team/audience via sharing your progress. We’ve seen the value of this each time we share transparently about what we’re working on at Buffer. If we were to apply this to our Facebook strategy. Form hypothesis -- If [variable], then [result] because [rationale]. Select KPI -- Which stat will be key to measuring success? Set goal -- What feels like an achievable, challenging target? We’ve written a bit in the past about how we’re aiming to set social media goals at Buffer. One of the keys for us to identify an intriguing metric that can have a big impact for our marketing. The first two buckets are the ones where you find the biggest opportunities for growth. Bucket No. 3 isn’t half bad either. Bucket No. 4 is best to be left alone. This type of thinking has been really helpful for how we might identify different social media metrics to pursue. For instance, with our Facebook page growth, we’ve noticed that we have a small number of people who view our Facebook posts (low traffic) but that a high number end up clicking through to our content (high conversion). We could then set up a goal to increase the low traffic by growing our Facebook reach, possibly by seeking more likes for our page. One of the unique elements of social media marketing is that the goals and objectives can come in so many different shapes and forms, depending on your brand’s mission. The goals often change, too, as you grow your influence online. What might these look like on the different social networks? 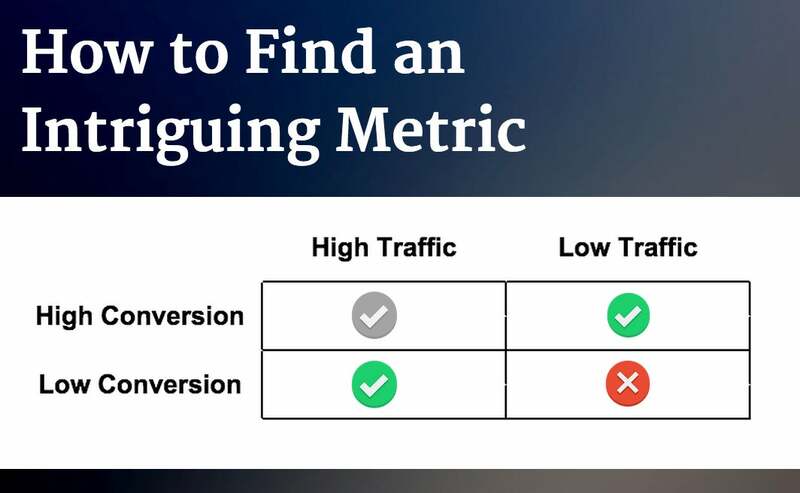 At Unbounce, Danielle Prager listed a number of measurable social media goals that you might consider setting for various channels. Here are her ideas for Twitter and Facebook.